Commander Ronnie Turner-Winston was born in Washington, D.C. A graduate of Bladensburg Senior High School, MD, followed by three semesters at University of Maryland enlisted in the United States Air Force (USAF) for one active duty tour and one inactive reserves tour. Educational accomplishments include an associate’s degree (AAS) in chapel management through Community College of the Air Force, associate’s degree in cosmetology, an associate’s degree (AA) from Parkland in business management, a bachelor’s degree from Eastern Illinois University (EIU) in Organizational Professional Development (OPD), a masters degree (MS) from EIU in technology and training and completing dissertation research towards a doctorate of education (Ed.D.) in organizational leadership from Grand Canyon University (GCU). A commanding officer at American Legion post #559 – holding offices/chairs at the post, county, district levels, as well as an officer for the women’s auxiliary unit and the advisor to the Sons of the American Legion squadron. She was elected as Champaign County Commander of the American Legion for the 2018-19 membership year. 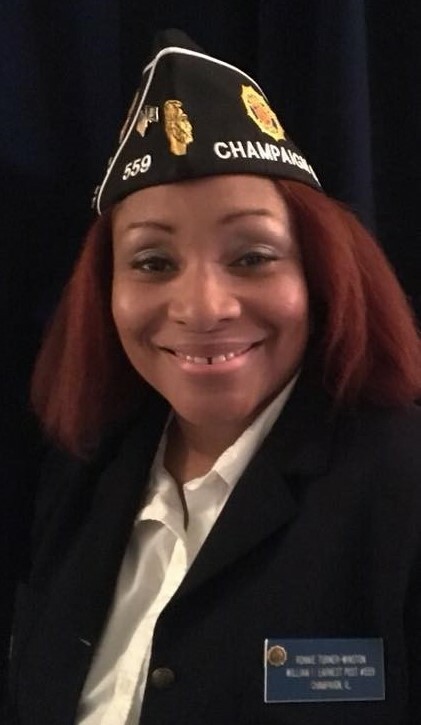 As an advocate for veterans and veteran’s services, she continuously reaches out to local, state and national politicians and governing bodies in the pursuit of veteran’s health and benefits overhaul and accessible resources. The Committee on Armed Services and Veteran’s; Affairs shall: (1) study conditions pertaining to veterans in the community; (2) serve as a center of information on material issued affecting African American veterans; (3) serve as a source of information to veterans and their families seeking information on government agencies serving veterans and; (4) receive and act on all veteran’s; complaints relative to discrimination on account of race, color or creed, or denial of benefits in local areas because of discrimination.